Last year my brother and I ran a pop-up coffee and doughnut shop at our local Saturday Market. It was one of the best (and more acrobatic) kitchen experiences I’ve ever enjoyed. We made all the classics, but the one doughnut that people came back for time and again was our maple bacon flavor. I loved seeing the looks of sheer doughnut-y bliss on people’s faces at first bite. This is a spin-off of that doughnut, true to my northern maple roots, and perfect for summer. In a medium saucepan, bring ¾ cup of maple syrup to a gentle boil; allow it to reduce for about 5 minutes. Reduce the temperature to low, and then add the cream, milk and a pinch of sea salt to the saucepan. Turn the heat up to medium; just before the mixture starts to simmer, remove it from the heat and allow it to cool slightly. In a medium bowl with a cloth underneath to keep the bowl from moving, whisk the egg yolks. While whisking constantly, very slowly add a small amount of the warm cream mixture to the yolks—just add a touch, you don’t want to turn the yolks to scrambled eggs. After gradually adding a couple of tablespoons, add the rest of the cream mixture to the yolks, whisking constantly to incorporate it. Pour the mixture into the saucepan, and cook over medium heat, whisking constantly (and wishing you went to the gym more), cooking until the custard is thick enough to coat the back of a spoon. Perfect! Custard! Pour the custard through a strainer set over a medium bowl, cover it with plastic wrap and refrigerate overnight. Run the chilled custard mixture through an ice cream maker, following the manufacturer’s instructions. When the ice cream is about ¾ of the way chilled, break the maple bacon into bits and add it to the ice cream. Do your best not to eat the entire batch before chilling it in the freezer, usually for about 8 hours or overnight. Preheat the oven to 400°. Arrange the bacon in a single layer on a baking sheet and baste it with 1 tablespoon of maple syrup. (This recipe calls for 6 strips, but believe me, you’ll probably want to make extra for those late-night snacks.) Bake for 20 to 25 minutes, until the bacon is nice and crispy; keep an eye on it so it doesn’t burn. Transfer the bacon to a paper towel–lined plate to drain; don’t leave it on the paper towel for more than a minute or two, or the bacon will stick to the paper. Set aside and allow the bacon to cool. In the bowl of a stand mixer (or in a regular bowl arming yourself with a whisk and ambition ), cream together the butter and sugars. Add the egg and beat the mixture together into a smooth batter. Sift the flour and baking soda into the batter and continue mixing until all of the dry ingredients are incorporated. Add the chocolate chips and mix them into the dough. On a parchment–lined baking sheet, arrange tablespoon-size balls of cookie dough a couple of inches apart, then freeze for about 10 minutes. Bake the chilled cookies for 10 to 12 minutes, until the bottoms are nicely browned and the tops are just about done. They should seem slightly undercooked on the tops when they come out of the oven, to get the amazingly chewy texture. If you can stand it, let the cookies cool on a rack for a few minutes. 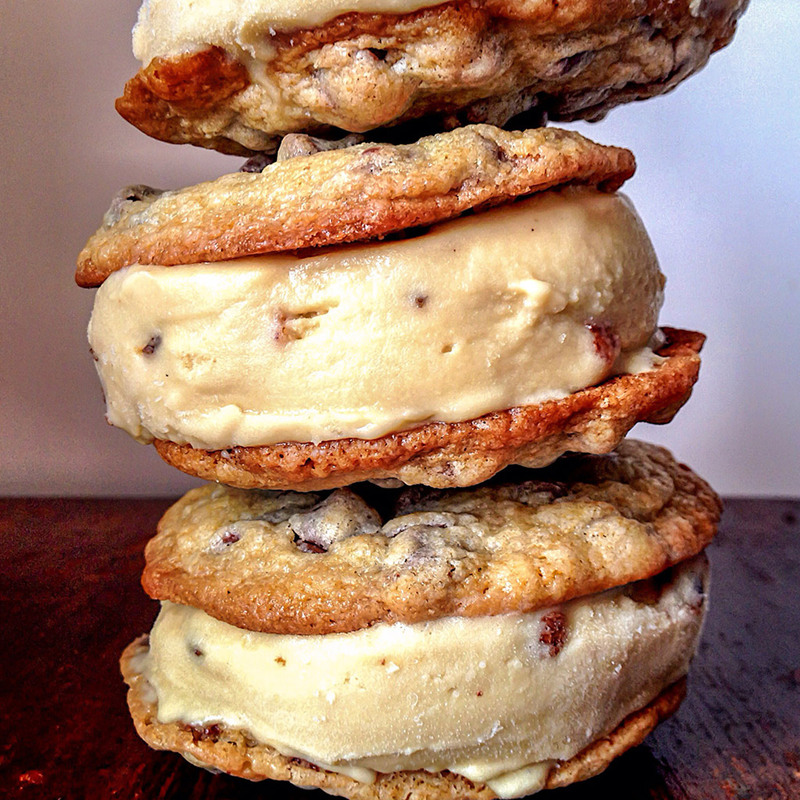 Allow the cookies to cool entirely before using them to make ice cream sandwiches. Enjoy! About Dennis Prescott: I am a Canadian musician turned passionate cook with an ever-growing obsession for all things food. I’ve yet to meet an egg I didn’t like, could live on Southern BBQ, and am a proud Maritimer both in heart and in kitchen. From burgers to lobster bisque and everything in between, the ultimate goal of my blog is to help in getting us back to the table, eating as an experience and really savoring every bite. Check out his blog dennistheprescott.com and follow him on Instagram at @dennistheprescott.